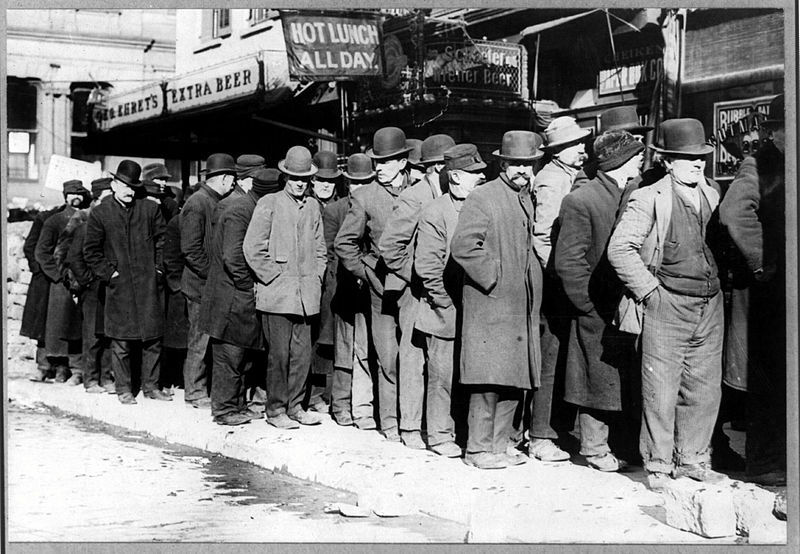 Lines for free soup during the Great Depression. We now have 93 million adults not participating in the workforce, but they’re not waiting for soup–they’re home with their wi-fi. Image from off the grid news, which has a great article on surviving a Depression. The basics: the Fed has announced a rate hike (the first since the Lehman crash in 2008) and the Dow is wobbling. Today (Friday) the Dow was down almost 370. While Wall Street has ample selfish reasons to wish for permanently ‘free’ money from the Treasury, the reality is that Janet Yellen’s actions are (to put it mildly) ill-timed. As I reported here a few months ago, European banking powerhouse HSBC is certain the world is already in recession. And as pointed out in The Telegraph, the timing of this rating increase makes no sense considering the numbers coming in. This is the first time the Fed has ever embarked on tightening cycle when the ISM gauge of manufacturing is below the boom-bust line of 50. Nominal GDP growth in the US has been trending down from 5pc in mid-2014 to barely 3pc. That isn’t the only indicator pointing at a recession. Junk bonds are having their worst year since the 2008 crash. Yields are going up, but not fast enough to compensate for defaults. Remember, per this post, that some 20% of all junk bonds are tied to oil. Over the last 18 months, the price for a barrel of oil has gone from around $100 to yesterday’s price of $34.73. The price of oil doesn’t go down because of production efficiencies–the ‘unconventional’ oil coming out of the sands and the shale needs oil prices to stay around $95 a barrel to service their bonds. And ‘conventional’ oil needs prices higher than $35 a barrel to service their junk bonds. What happens if a fifth of the junk bond market goes up in smoke? And there’s more to that story. Oil demand is tied to economic growth. Companies don’t need lots of energy if they can’t sell their products. They also don’t need to utilize shipping. Per this industry analysis, demand for shipping is also down. Fitch Ratings has revised the global shipping sector outlook for 2016 to negative from stable in 2015. We expect muted global trade growth and the economic slowdown in emerging markets to exacerbate overcapacity, leading to declining and volatile freight rates. But performance will vary across the segments, with dry-bulk and container shipping under pressure, while tanker and LNG shipping fare better. And then there’s China. China’s economy has even more systemic weakness than Greece. And China’s economy is based on exports–demand has fallen for all the things China makes thanks to people in the West lacking discretionary income. Enough said. Remember–per financial journalist James Rickard, the world is in a structural depression.”You cannot solve a structural problem with a cyclical remedy. Monetary policy will not work.” Janet Yellen may have made things worse, but the FED alone can’t make things any better. We’d need an FDR New Deal policy set that would include debt cancellation and stimulus worldwide. Either that or a world war. PS: extra credit–the end of the American Dream and the indications thereof. The only one supporting another New Deal is Sen. Bernie Sanders. That’s why we need him for President. Brian, if you’ve read some of my other posts, you know that I support Sanders. But the political reality is that for a President Sanders to enact anything close to what’s needed would require a historically unprecedented flip of both the House and Senate (and a flip of a bunch of state houses and legislatures as well). And it’s not clear that the Dems will reap any sort of electoral award in 2016 if the economy has crashed in the ways I’ve laid out here.